Dangerous gas is bubbling out of the mud volcano. The Trinidad and Tobago Institute of Marine Affairs has warned fishermen and other boaters to stay away from the mud volcano off the east coast of Trinidad as it is emitting methane, a flammable gas. This situation could be hazardous if the gas was ignited. The volcano has grown 45 feet over the past four months and is now within four feet of breaking the sea surface. Pavlof Volcano on the Alaska Peninsula is erupting. Eyewitnesses on several ships reported seeing incandescent blocks falling down the east-southeast flank of the volcano Tuesday night. The observatory had already raised its aviation alert code for the volcano from yellow to orange, and the alert level from advisory to watch, based on heat readings by weather satellites and an escalating swarm of earthquake signals from sensors on the mountain. A pilot reported a weak ash plume extending five miles southwest of the summit at about 8,400 feet elevation. Scientists said the eruption could become stronger at any time. Immediate hazards around the volcano include light ashfall on nearby communities, mud flows in local drainages, and lava flows and avalanching of hot debris on the upper reaches of the volcano. 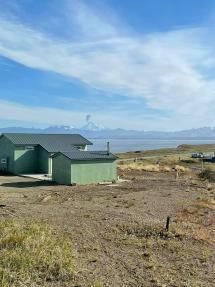 Attention was first drawn to the volcano, 37 miles northeast of Cold Bay, when earthquake activity increased abruptly on Tuesday. Similar patterns of seismicity occurred before eruptions in 1996, 1986, 1983 and 1981.